I can keep asking the same questions over and over again from flashcards or a list or try to come up with my own on the spot, but I generally get the same bored faces from my students when I am drilling them on "WH" questions. I just can't seem to find a way to make asking them questions over and over fun. The only exception is when the "WH" questions are in game or application format. WH-Questions Island combines the speech-language pathologists' love of pirates (okay and the children's too...) with a board game style application. Continue reading to learn more about this how this application combines asking "WH" questions with fun! The Main Page shows a pirate ship with four different options - Start, Settings, Reports, and Info. Press the "Info" button to be brought to the Information page where you can learn how to use the application, the intended population, and the types of questions asked. In addition, there are buttons on the left hand side of the page to view more applications by Virtual Speech Center, sign up for Virtual Speech Center's newsletter, and follow Virtual Speech Center on social media. To begin application play, press the "Start" button. If you have not entered a student into the application, press the "Add Student" button on the "Select Students" menu. Then, press on the blank rectangle to type in a students' name via the keyboard and press "Save". To select a student, press on his or her name on the list and a check mark will appear. You can select multiple users. Once you have selected who will play the application, you can determine the type of activity to play. Choose between "Flashcards" and "Board Game". Press "Next" once the user(s) and activity have been chosen. Flashcards - Shows one flashcard at a time with a question to answer. You can hear the narrator state the sentence or question by pressing the green arrow in a circle button on the left hand side of the screen. If the client answers the question correctly, press the green check mark button on the right hand side of the page. If he or she answers incorrectly, press the red "x" button. When a response is scored, it will change the percentage of accuracy on the right hand side of the page in the pirate loot bag. The number of trials will show above the accuracy. Then, you can press "Next" to go to the next flashcard. If you would like the client to record a response, press the red circle button to the left of the flashcard to begin recording and the rectangle to stop recording. Press the green triangle "Play" button to play the recording back. Board Game - A board game will appear on the screen with spaces that have different pirate animals, treasure, and question marks on them. A player will be chosen to go first and spin the spinner by tapping it in the middle of the game board. Then, the player's token will move the associated number of spaces on the board (1-4 spaces). If the player lands on a question mark, a question flashcard will appear to answer. If the user answers the question correctly, press the green check mark button and the accuracy will be updated. If the user answers the question incorrectly, press the red "x" button and the accuracy will be updated. You can also have the user record an answer via pressing the red circle button and pressing it again when done recording. To hear the recording played back, press the green triangle button. You can hear the question stated by pressing the circle arrow button. If the user lands on a crab or crocodile space, they are bumped backwards one space. If the user lands on a parrot or butterfly space, they are bumped forward one space. If the user lands on a pot of gold, an animation plays. Whomever reaches the end of the gameboard first wins the game. After you choose the activity, select the question type for each user and whether it will be answered expressively or receptively. You can press on an individual question set and a check mark coin will appear next to it when selected. There are buttons at the top of the list to select all question sets, select all receptive question sets, select all expressive question sets, or to deselect all question sets. Receptive language question sets will ask the user a question and give three choices of answers to choose from and press the correct answer. Expressive language question sets will ask a question and have the user answer it aloud with the speech-language pathologist determining accuracy of the answer to score the question. Next, choose an avatar to use in the game. Finally, press the "Next" button to begin the activity. Once all trials have been completed or the "Finish" button has been pressed, a Session Report will show. You can also access Session Reports from the "Reports" page by pressing the "Reports" button on the Main Page. Session Reports show the client name(s), date/time of the session, the question set, and the accuracy of questions answered in a graph form. Session Reports can be accessed via the "By Date" tab on the Reports page. If you press the "By Goal" tab after choosing and highlighting a user, then highlighting the goal to be viewed over time. A graph will appear showing the client's name, goal, session date(s)/time(s), and percentage(s) of accuracy. You can e-mail either type of report by pressing the "E-mail Report" button at the top right of the page. This will bring up a pop-up window from the "Mail" application with the report pasted into the e-mail. You must have your e-mail associated with the "Mail" application and an internet connection to use this. If you wish to delete a user, press the pencil button by the "Select User" text. Then, press the red circle with a minus button next to the user whom you wish to delete. Finally, press the "Delete" button. When playing with more than one user, the application automatically moves between users' turns. You can choose to have users answer the questions using receptive or expressive language skills. The application keeps track of data each session and over time. You can e-mail reports to yourself in graph format. This is very helpful for IEP meetings. The fact that the application has a game associated with it is highly motivating for my students. They definitely love the different images and animations when playing. Showing images associated with the questions helps the user by adding additional information. Having the option to have the question in text form and stated aloud by a narrator helps users who need textual or audio support. I would like to be able to see the lists of questions in each set to be able to decide which set to use with my students. It would be great if the questions were shuffled more in a set or when using multiple sets. It would be nice to be able to delete individual reports. Also, sometimes when I mess up settings for a certain student, I have to exit and re-enter into application play; however it still creates a blank report. It would be great if that did not happen as it adds additional, unnecessary reports to a list. Articulation/Fluency/Voice - Have the user read the question aloud using his or her best speech sounds, fluency strategies, or vocal strategies. Receptive Language - Have students practice answering questions using the application. You can have them practice who, what, where, when, why, or how questions. Expressive Language - Have students practice answering questions using the "Expressive" language question sets. Vocabulary - Children can learn about different vocabulary terms through the questions on this application. 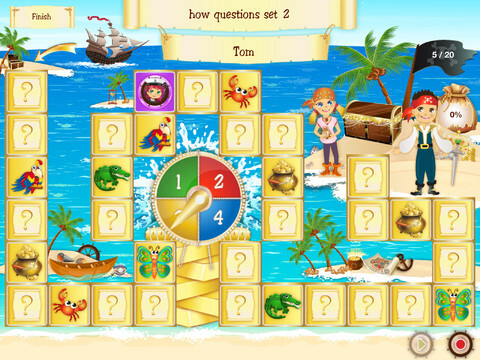 WH-Questions Island is available for the iPad for $9.99. Consonantly Speaking was given a copy of this application to review. No other form of compensation was given.